The recent post by jcd925ec of Visual Family Tree Maker seemed to engender a reasonable amount of interest. I had a look at the link that Baas gave (in answer to webfork) and saw that the review found a lot of problems. Not uncommon with genealogical programs so I thought I'd provide an alternative. 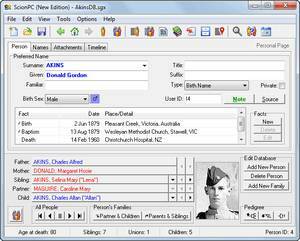 ScionPC is a comprehensive Genealogical Management System. It is stated to be portable and implicitly stealth. I'm sure a PFC regular will confirm or deny! The Home Site provides very detailed information about the program. Saves settings to ScionPC.INI in program directory. ]Thank you shnbwmn - appreciate that. A very nice find, thank you, in my opinion ScionPC deserves to be added to the database. ScionPC at version 8.3, change log, download page, gallery, features and direct download link. We have not found a user group or forum but he is responsive.The program is free of problems and fairly easy to understand. We really haven't had any questions. We've only found one difficulty with Scion PC, which is not a problem if you are aware of the setting. Default is to convert surnames to UPPERCASE, not a good idea. Can be unchecked at import. Otherwise, like most, if not all genealogy software, many citations, sources are stripped upon GEDCOM import. But it does report what it took out.